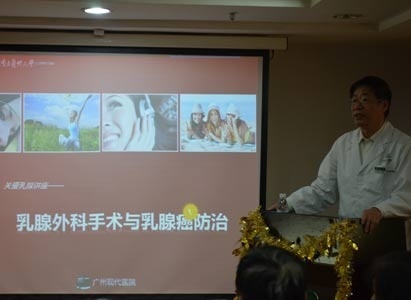 In the afternoon of Dec 26, 2013, Modern Cancer Hospital Guangzhou held a public lecture on “Breast surgery and breast cancer prevention”, which attracted more than 100 people to attend. Professor Wang Xin, the breast surgeon of Modern Cancer Hospital Guangzhou, was the keynote speaker. He has been engaged in surgical oncology for more than 30 years and has solid theory foundation and rich clinical experience. Wang shared the information on breast cancer and breast surgery to audience with easy and plain words. Breast cancer is ranked as the top one women’s malignant tumor and regarded as the first killer of female health. In recent years, breast cancer incidence increases year by year and threatens female’s health severely. Professor Wang said surgery is the main treatment for breast cancer from the past till now. From Halsted classical radical operation in the late 19th century to expanding radical operation in 1950s and to improved radical operation in 1960s,then breast conservation surgery in 1980s until now, breast surgery has about 109 years history. After explaining each breast surgery, Professor Wang talked about the causes, symptoms and prevention of breast cancer. The whole lecture lasted for about one hour and Wang also answered audience’s questions patiently and gave professional suggestions accordingly. People who attended the lecture all benefited a lot and impressed by Professor Wang’s informative and interesting speech. 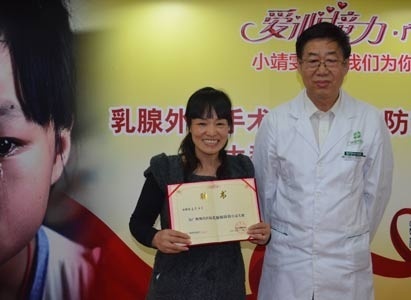 During the lecture, on behalf of Modern Cancer Hospital Guangzhou, Professor Wang awarded Ms.Wang Yan, mother of the “soybean milk girl “Jing Wen , as the “Anti Breast Cancer Ambassador”. Ms. Wang was so excited to share her anti cancer story with the audience. She said that breast cancer can be prevented and treated; it is not that horrible as you thought. Women should pay close attention to their health and learn the way of self-inspection so as to detect the disease early and take prompt treatment. 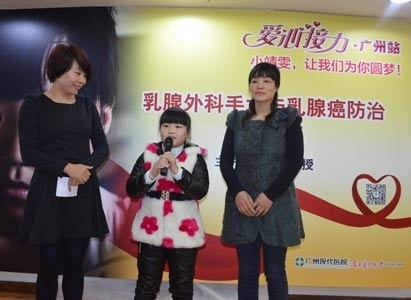 Soybean source girl Jing Wen also shared her three dreams with the audience --Her first dream was that the steel plate in his father’s leg could be taken out, second dream was her mother could have a quick recovery and the third dream was hoping to have a chance to sing again. At present, the first dream was realized with the help of Hunan Liuyang Nianlun Orthopaedic Hospital. Now that Modern Cancer Hospital Guangzhou has taken over the relay baton of love to have full breast checkup for Jingwen’s mother and confirmed the cancer is now under control. We also take this chance to wish Jing Wen’s family to be away from illness and have a happy and healthy life.